We decided to cycle the Moselle river from its source in France to Koblenz, Germany where the Moselle meets the Rhine. 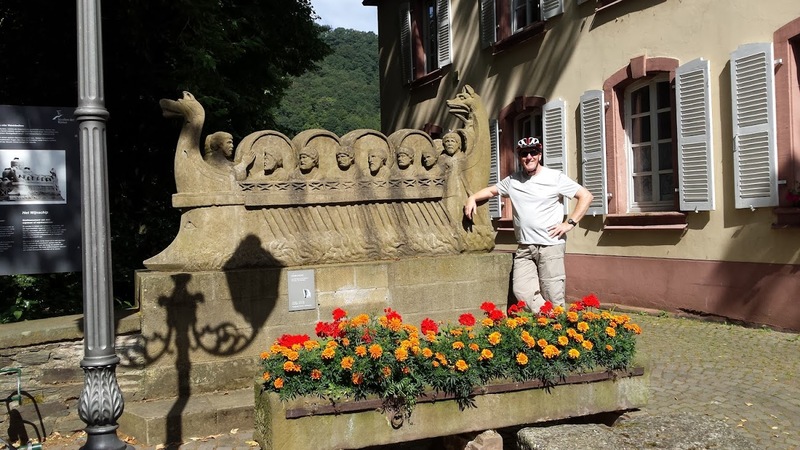 Our plan was to fly to Basel Switzerland with our bikes, cycle to Mulhouse in France then catch a train to Fellering where we would start the ride proper. 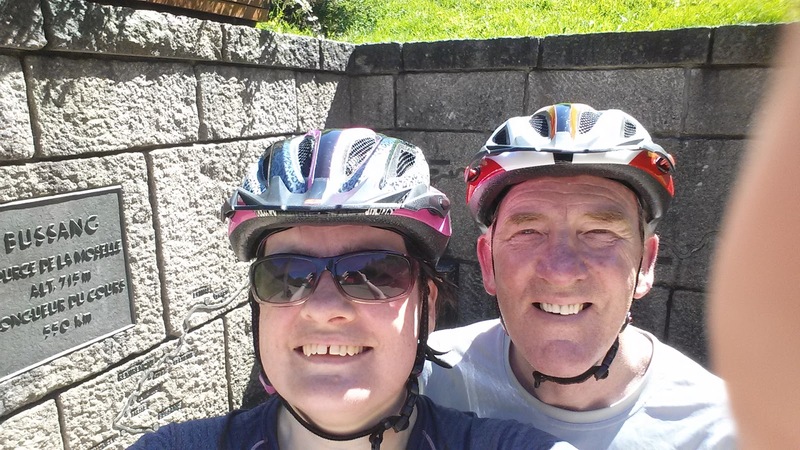 So on the 9 July 2016 we cycled to Manchester airport to catch our Easyjet flight to Basel. 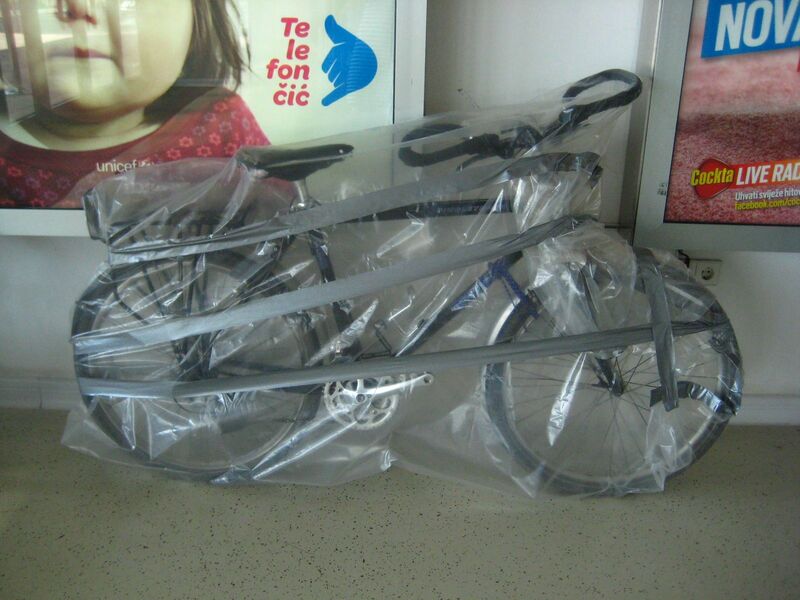 On arriving at the airport we placed our bikes in the CTC clear plastic bags we had bought, meaning we only had to turn the handlebars and remove the pedals. It went surprisingly easy at the airport with the bikes being checked without incident. 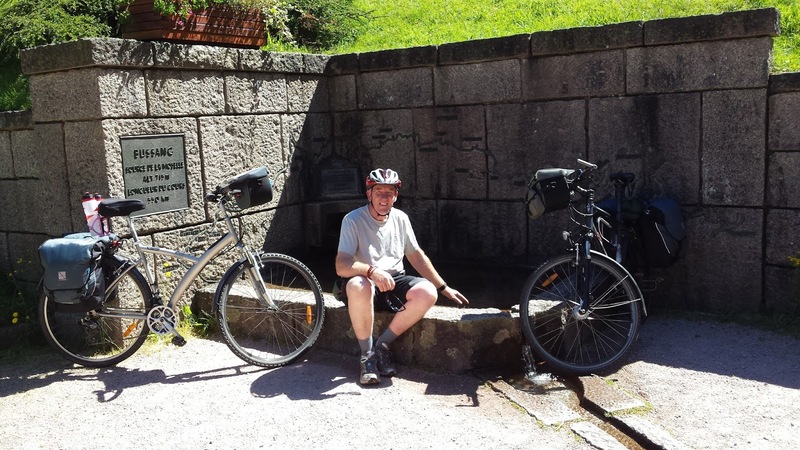 On arrival at Basel we collected the bikes from the oversize area and set the bikes up using the bike tyre pump provided by the airport (you don't see that facility in UK airports). 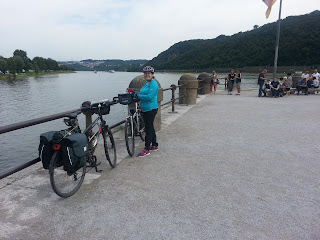 On leaving Basel airport we set off for Mulhouse via a cycle track through woods, and on to our hotel (Best western hotel de la bourse(https://www.bestwestern.fr/fr/hotel-Mulhouse,Best-Western-Hotel-de-la-Bourse,93670)) and put our bikes in their storage area. 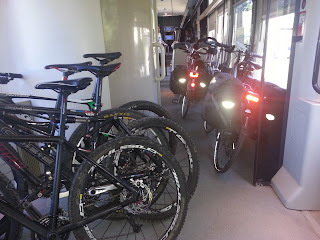 The next day, we caught the bicycle friendly train to Fellering station where we started our ride. 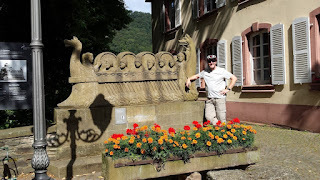 Then down hill to the source of the Moselle. 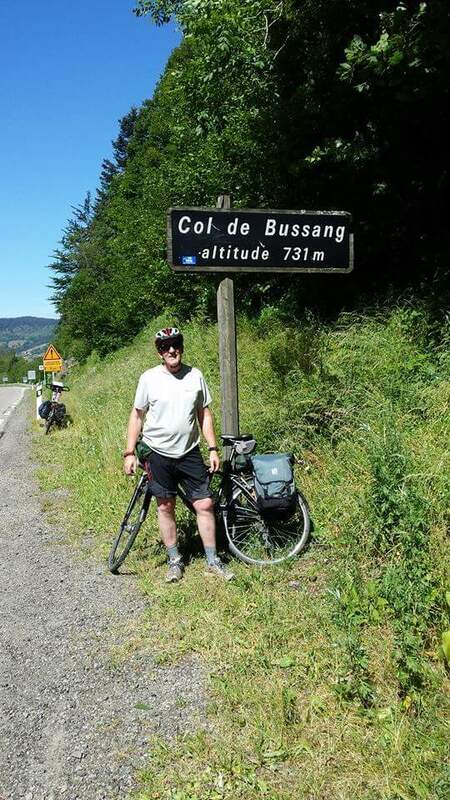 And then continued downhill to the town of Bussang for food and drink. which follows the route of a disused railway track. 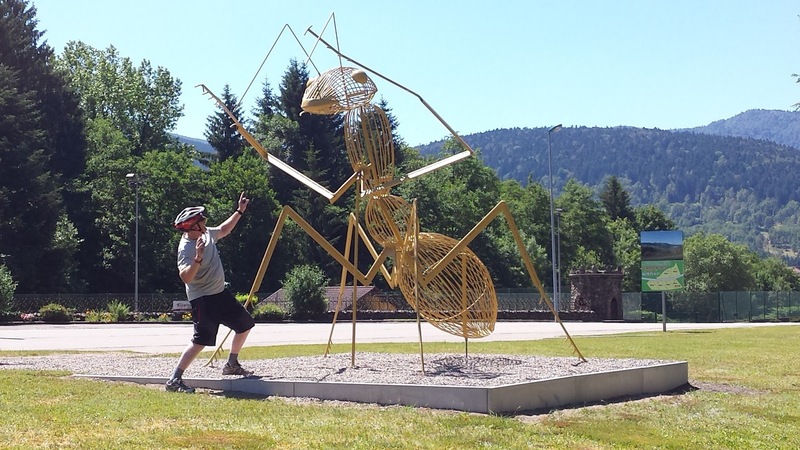 Graham being attacked by a giant ant! There is a really good Pizza place in this town called Stop Pizza (22 Boulevard Thiers, 88200 Remiremont) good food for the weary traveler. passing a stone statue of an owl near Eloyes. 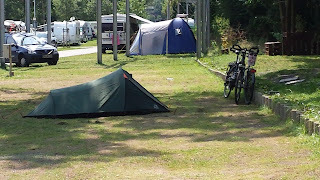 On arriving at Epinal we found the Parc du Chateau campsite at the top of a long hill (http://www.camping-parcduchateau.com/fr/accueil-p1.php). 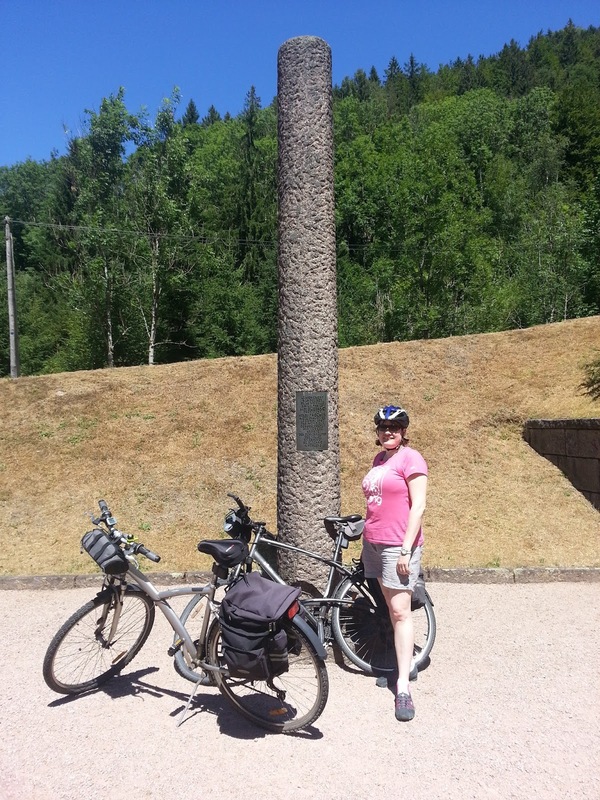 From here we visited the ruins of Epinal castle. On leaving the campsite the next day, we cycled down the hill and across the river. Passing an old red English phone box we cycled between the river and the canal, eventually crossing the river on an aqueduct. 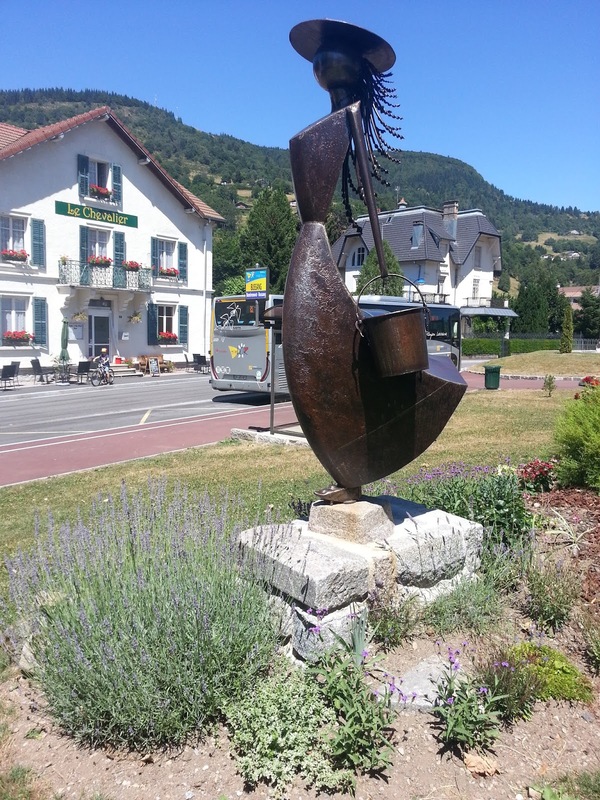 We continued on passing through the town of Charmes. 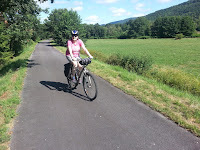 Now cycling along the canal which runs parallel to the Moselle, to Mereville where we stayed at the Logis Hotel Restaurant La Maison Carree (https://www.logishotels.com/fr/hotel/hotel-restaurant-la-maison-carree-180?partid=661). After lunch we had a look round the town and the cathedral. 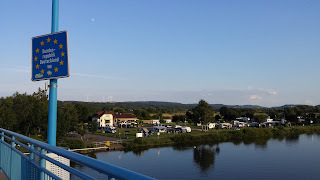 We continued along the canal to Liverdun, where we stayed at a lovely campsite Les Boucles de la Moselle (https://www.lesbouclesdelamoselle.com/nl/). The next day we set off in the rain, heading for Metz, along the canal. This part of the route, is a little rough in places as this department hasn't maintained its section of the cycle paths, This becomes obvious when you get to Noveant-sur-Moselle in the next department where the rough cycle route suddenly turns into a tarmac cycle path. 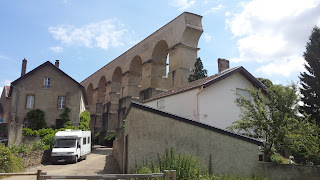 Continuing on to Jouy-aux-Arches, where the remains of the Roman aqueduct can still be seen. Which was originally over 1km long, spanning between Ars-sur-Moselle and Jouy-aux-Arches. We continued along the river to reach Metz where we found the city deserted, it turned out we had arrived on Bastille day, and all the shops were closed. 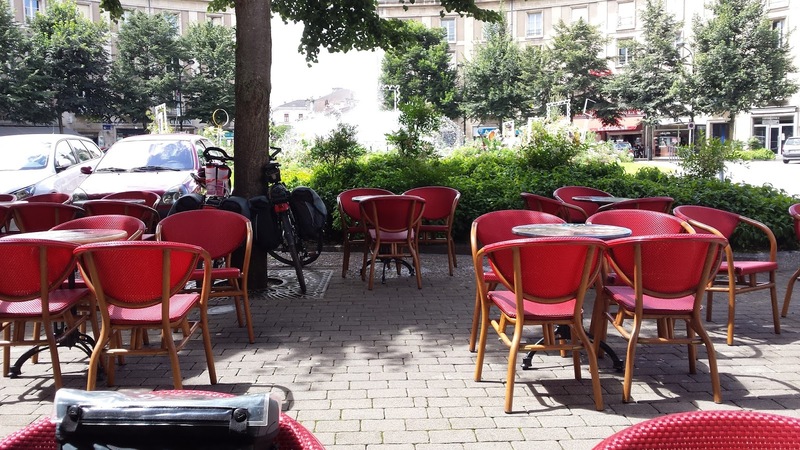 However we found a hotel near the train station, Hotel Terminus (13 Rue Lafayette, 57000 Metz, France). As we cycled on out of town, a very nice gentlemen called Thiery on recumbent bicycle approached us and asked where we were going, he then offered to accompany us to Thionville. Along the way we met a German guy towing a small caravan on the back of his battery assisted recumbent bicycle. 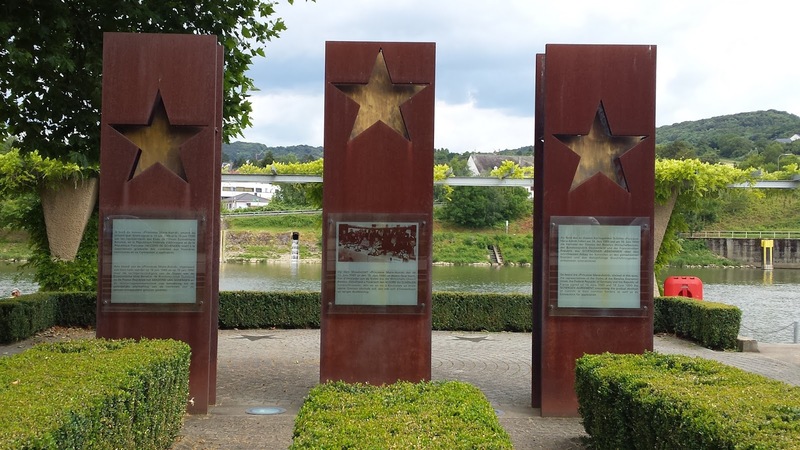 As Schengen was very expensive to stay we continued on to Remich. 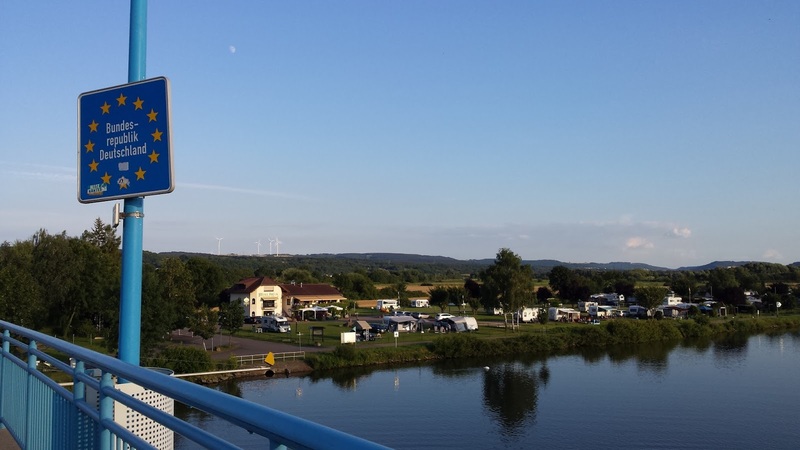 Where we crossed the Moselle from Luxembourg into Germany to our campsite Mosel-Camping Dreilandereck (http://www.mosel-camping.de/) where we stayed the night. 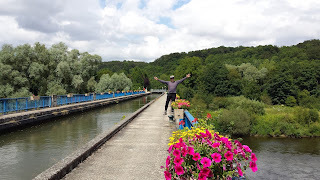 The next day we crossed back across the bridge into Luxembourg following the Moselle to Wasserbillig, where we crossed the border back into Germany again. We continued onto Trier. 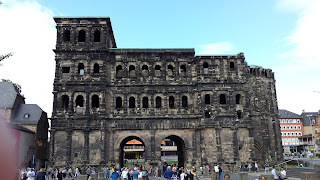 Trier is an interesting city with lots of Roman archaeology including Porta Nigra. From here the route gets busier as this is the more popular part of the Mosel. 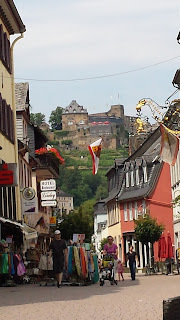 we continued onto Leiwen. A lovely quiet little village on the banks on the banks of the river. 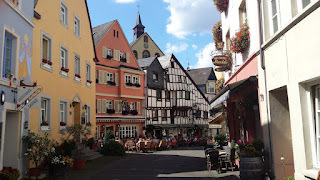 Here we stayed at a comfortable little guest house serving simple but tasty food, Gastehaus-Strausswirtschaft Lowenhof (http://www.moselhotel-loewenhof.de/de/). We followed the cycle path to Neumagen, considered to be Germany's oldest wine-growing settlement. Along the river there is an impressive reconstruction of a Roman galley. 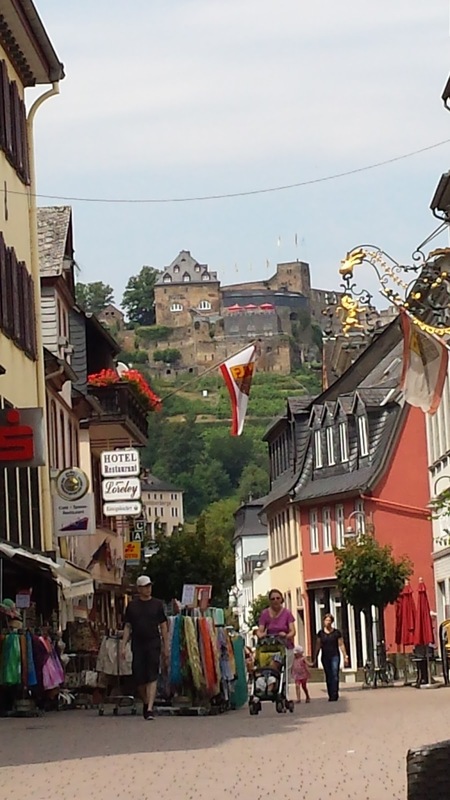 We continued along past beautiful scenery finally arriving at a lovely town of Bernkastel-Kues. 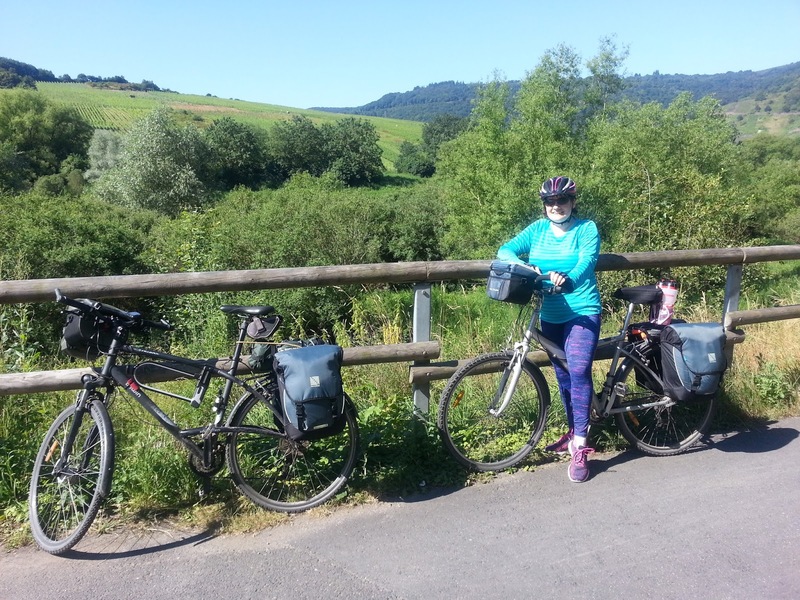 Cycling on we passed through pretty, but touristy towns of Tarben-Trarbach and Punderich finally arriving at Zell the second largest wine producing town in the Mosel valley. 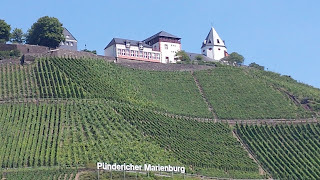 Here we stayed at the Cafe-im-Hamm hotel with wonderful views over the Mosel. 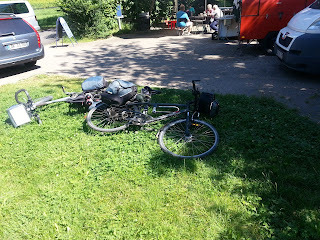 Here we stopped at a cafe by the river for some lunch. Continuing on we next arrived at Neef where we crossed the river to Breem (somewhere we intend to return, to do the Klettersteig path crossing the steepest vineyard) Our next stop was another lovely little cafe along the Mosel at Nehren (to give the bikes a rest). Two tired bikes having a rest! 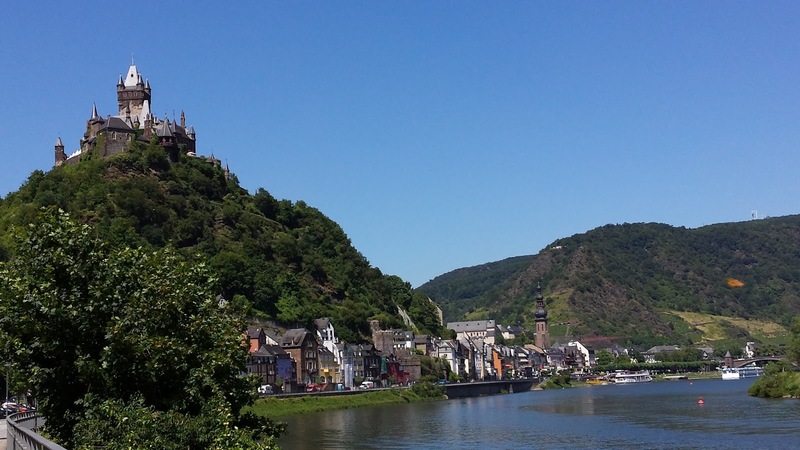 Our next stop would be Cochem. 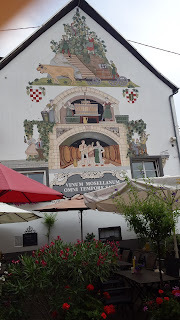 We started our last day along the Mosel passing through more vineyards and pretty little villages, heading towards Koblenz, and passing through the picturesque little town of Winningen with its quaint old buildings and wall paintings. 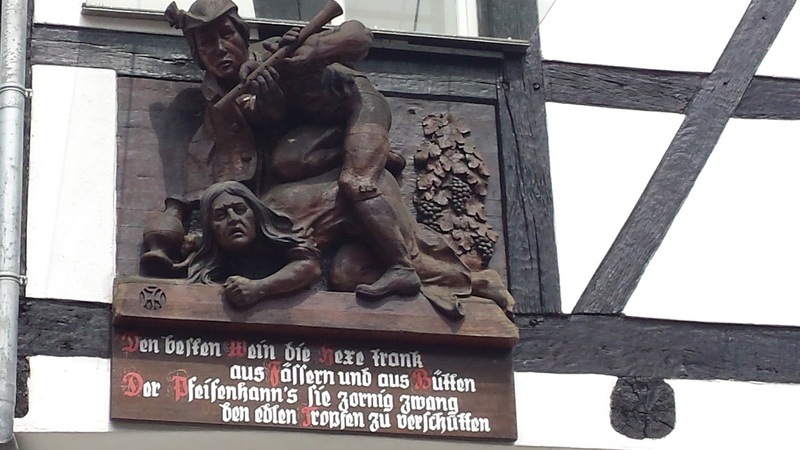 This town became regarded as a centre of witch craft with 21 people sentenced to death for being witches or wizards between 1630 and 1661. Now nearing our journeys end we continued on through gorgeous contryside and vineyards until we reached the city of Koblenz and the meeting of the Mosel and the Rhine rivers. Here we stayed at the worst campsite we have ever stayed at, Knaus campingpark (http://www.knauscamp.de/rhein-mosel-koblenz.html). A dismal site with poor facilities for tents. The picture does it more justice than it deserves, the ground was rock hard and by the evening it was crammed with other tents. No shelter and no where to sit. The only redeeming feature is they have a really nice cafe on site. 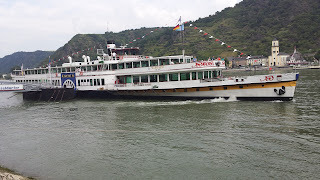 The following day we did a river cruise along the Rhine, passing many castles along the way finally arriving at St Goar, a pretty little town with a castle on the hill. On the Sunday morning we packed up and set off to the train station, to get our train to Basel via Frankfurt where we changed trains. It is interesting to note the difference in attitude to carrying bikes on trains between Germany and the UK. The Germans make it so easy. This was a long 4 and 1/2 hour journey having got to the train station at 5am. Our flights weren't until 10pm that night, so we spent the rest of the day exploring Basel. Come the evening we cycled out to the airport, where we repacked our bikes ready for the flight back to the UK. We arrived back in the UK at about midnight. 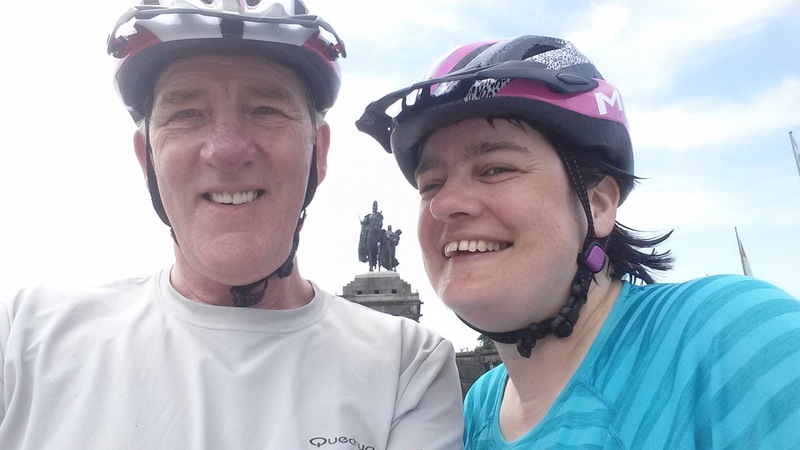 We then had to reassemble our bikes and cycled the 7 miles home, arriving home absolutely knackered at about 2am after a long long day. Despite that, it was an absolutely wonderful holiday, which I would thoroughly recommend. 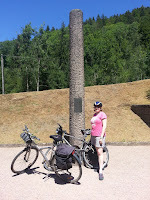 Anyone interested in a detailed explanation of this route should buy the Cicerone Guide The Moselle Cycle Route. an excellent guide to this route.